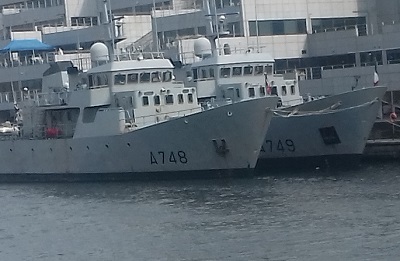 French Navy ships : Léopard (A 748), Panthère (A 749) and Lion (A 755) in West India Dock. 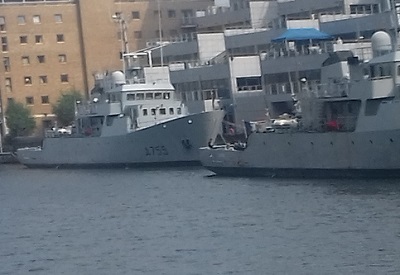 May 31, 2018 5:47 pm / 2 Comments on French Navy ships : Léopard (A 748), Panthère (A 749) and Lion (A 755) in West India Dock. 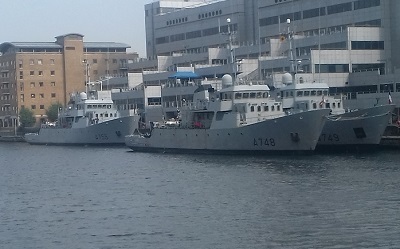 After a very quiet period in West India Dock, we welcome the arrival of three training ships of the French Navy. 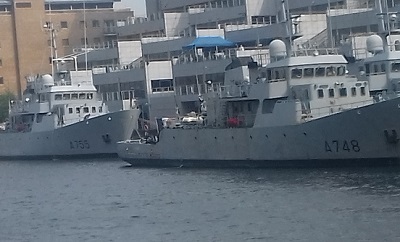 Léopard (A 748), Panthère (A 749) and Lion (A 755) are Léopard-class training ships which are used for navigational and practical training of potential French officers. In the 1970s, the French Navy decided to build eight vessels to provide practical training in the operation and navigation of naval vessels. Lion were built by La Perrière in Lorient, and Panthere and Leopard were built by Ateliers et Chantiers de la Manche (ACM) in Saint-Malo in the early 1980s. These types of vessels have been regular visitors in the last few years, but I do believe these particular ships last visited in 2013. The ships of this class usually have a crew composed of 1 officer, 10 sailors, and 4 quartermasters; plus 1 or 2 officers, 2 instructors, and 18 students. Still in the dock is the Marienborgh yacht, so for a short time we have plenty of interest in the dock rather than watching the various developments around the dock moving higher and higher. I expect the visit is just part of the training on the ships and it is not known how long the vessels will be in the dock. 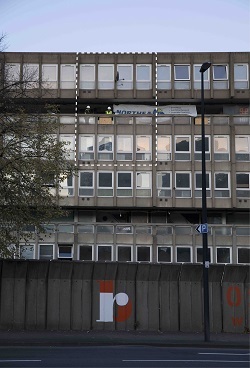 The demolition of Robin Hood Gardens has been the subject of much recent debate in the architectural world, the housing estate in Poplar is considered an internationally significant example of Brutalist architecture. However the building was refused protection by being listing, and will be replaced by a £300m redevelopment of affordable and private housing. Robin Hood Gardens was designed by British architects Alison and Peter Smithson and completed in 1972, it was based on twenty years of research by the Smithson’s into social housing and intended to be a new model of urban organisation. Whether the building ever achieved these lofty ideals is unlikely but the building has been a familiar landmark in Poplar for 50 years. When the demolition is complete, little will remain of the building. However, part of the building will be making a trip to Venice to take part in the La Biennale di Venezia for the International Architecture Exhibition. In the Pavilion of Applied Arts, the V&A will present Robin Hood Gardens: A Ruin In Reverse, centred around fragments of Robin Hood Gardens. Concrete fragments from the housing estate will be on display. Altogether the V&A salvaged a three-storey section of each façade and the original interior fittings of two flats. In Venice, three storeys of the façade will be reassembled on a scaffold designed by ARUP, who engineered the original building The structure will allow visitors to stand on an original section of a ‘street in the sky’, the elevated access deck. There will also be a new work by Korean artist Do Ho Suh who recorded some of the building and flats before they were torn down. Through archival photographs and specially recorded interviews, the exhibition looks at the vision and fate of Robin Hood Gardens. 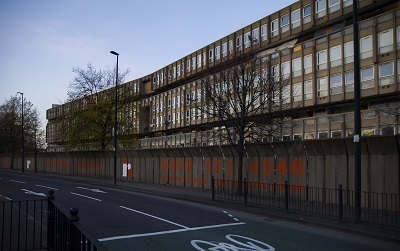 Ironically in 1976, the Smithson’s contributed to the Venice Biennale where they displayed a billboard-size photograph of Robin Hood Gardens with the slogan ‘A building under assembly is a ruin in reverse’. 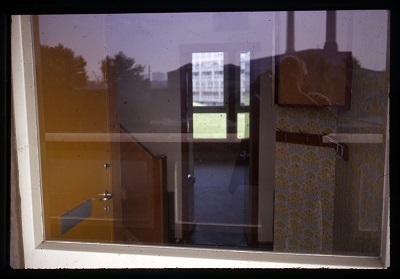 Interiors circa 1970 by Peter Smithson-courtesy of the Smithson family collection. In many ways, Robin Hood Gardens illustrates how many of the social housing projects from the 1960s and 1970s came to a sad end. They often had good intentions to foster community spirit but the designs were often impractical and buildings were often not maintained by local authorities. 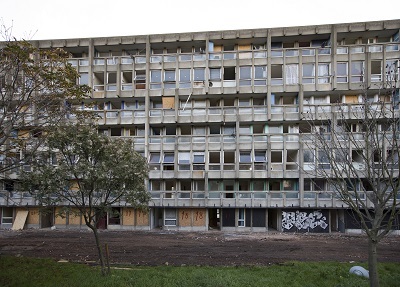 With many of these post war housing projects being now demolished or redeveloped, the question of what kind of social housing should be built is still a matter of some debate. 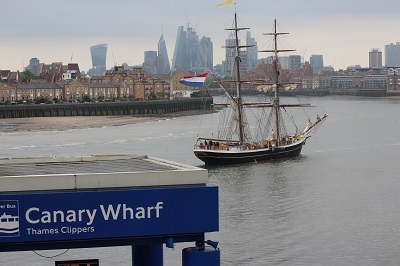 Walking near to Westferry Circus, I saw the unmistakable sails of a tall ship and hurried to see which ship it was. To my surprise it was the Morgenster which reminded me of one of my great experiences from last year. 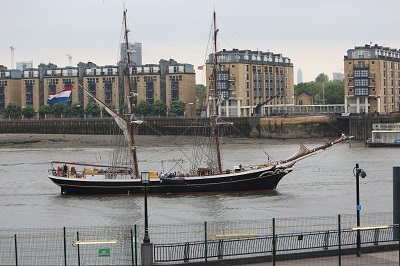 Morgenster was one of the ships taking part in the Rendez-Vous 2017 Tall Ships Regatta and I was fortunate to be invited to take a trip on the Morgenster from Woolwich to Greenwich. 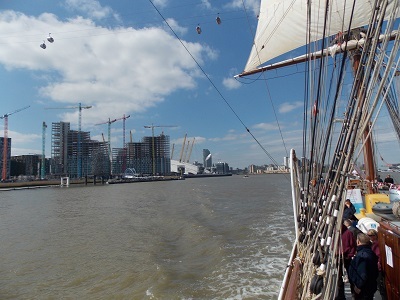 Whilst I have seen a lot of Tall Ships in West India Dock and at Greenwich and occasionally been on board to have a look around, actually sailing on a ship down the Thames was a wonderful experience. 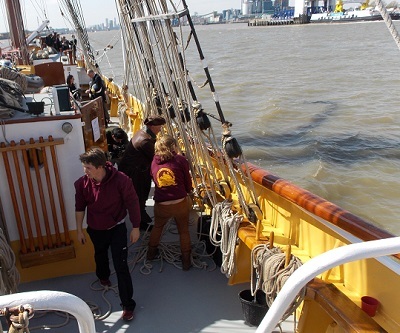 There was something special about being under sail even in the safe confines of the Thames, before I get carried away it is worth mentioning that for the crew it is more hard work bringing down the sails and carrying out various duties. It did give me some insight into how much work would be involved sailing one of these ships across the Atlantic. The Morgenster or (Morning Star in Dutch) is a sail training ship based in the Netherlands. 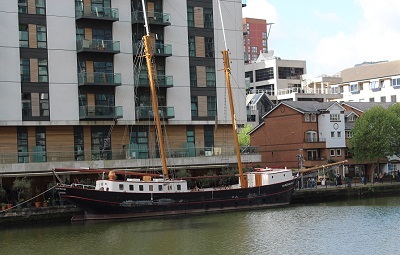 She was originally built, as a herring lugger under the name De Vrouw Maria, in 1919. In 1927, she was converted into a motor fishing vessel. She was renamed Morgenster in 1959 and continued to be used as a fishing vessel until 1970. 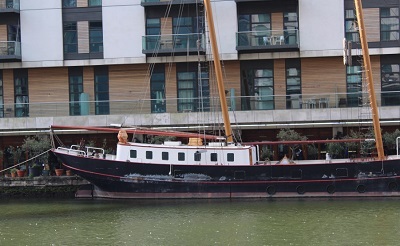 After a period of use for sport fishing and a pirate radio station, she was converted back to a sailing vessel in 1983. She made her maiden voyage as a sail training ship in 2008, having been refitted as a brig. 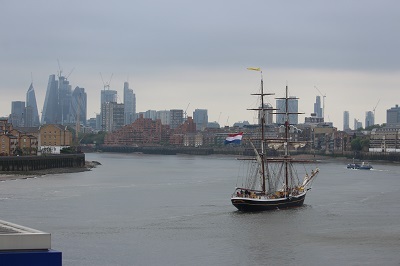 She certainly looked a magnificent sight as she meandered her way along the Thames on her way to Tower Bridge. It has been a very quiet winter for visitors to West India Dock, no doubt due to the on-going building works around the dock. 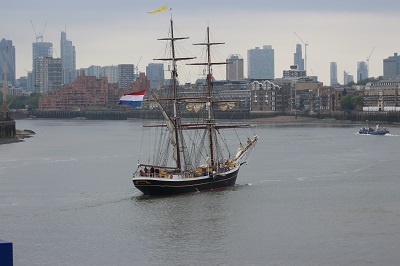 However we do have an interesting visitor with the arrival of the Marienborgh. 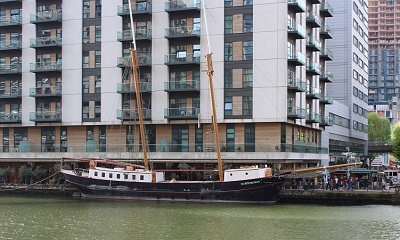 The boat is a two-mast schooner that dates back to 1912. 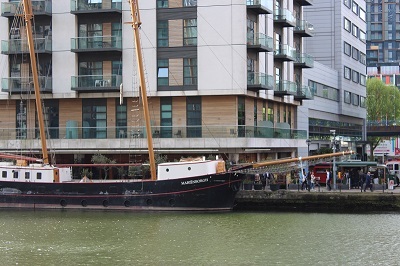 There have been long term plans for boat to be fitted out as a luxurious dining venue. It was first proposed in 2012 but since then the boat has been to Holland and has been spotted in King George V dock in the Royal docks. Little is known about the background of the boat or its plans but it has been put up for sale a number of times in the last few years. Last week when it looked like Spring had finally arrived, I put on my walking shoes and wandered around Island Gardens and Mudchute Park and Farm. Arriving at Island Gardens it was with some surprise to see that the Calder Wharf development had started. 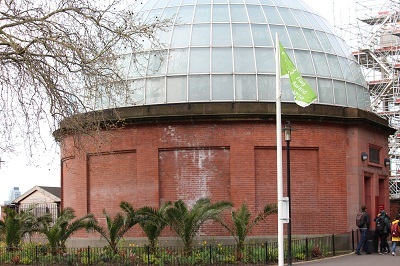 The development has been the subject of some controversy due to its design which brings the property right up to the Island Gardens wall and dominates the dome where the foot tunnel is located. First impressions are not very good and the local community is still seeking answers to why the development has been allowed to go ahead without adequate consultation. 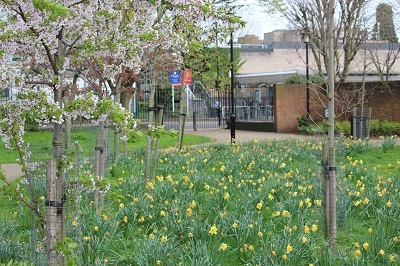 Better news was a flag that denoted that Island Gardens had been selected to receive a Green Flag award which is a national quality standard for parks and green spaces. Wandering around the gardens it was easy to why the award was given, spring flowers were in abundance and the blossom was on the trees. 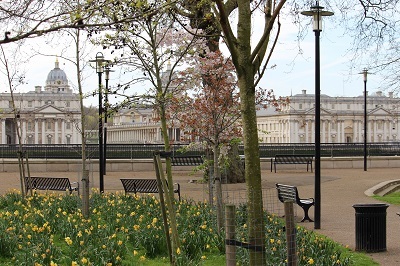 One of the most unique features of the gardens is the view across to Greenwich, this famous view is still one of the great views of London and has remained largely unspoiled for centuries. 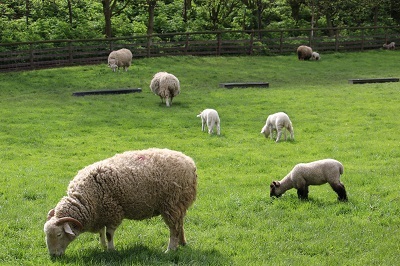 We are very fortunate on the Island that we have Island Gardens and Mudchute Park and Farm. 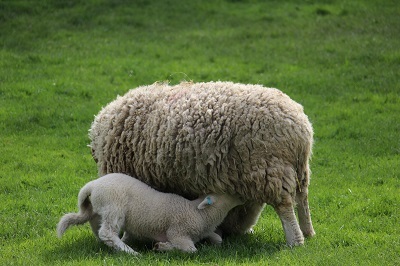 Spring is a wonderful time to visit the farm with spring lambs running around the field. Local children stood captivated as the different breeds of sheep showed off their young lambs. 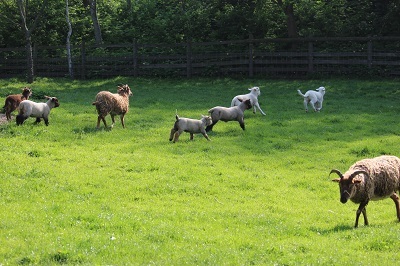 The lambs began racing each other around the field till it was time for a drink. 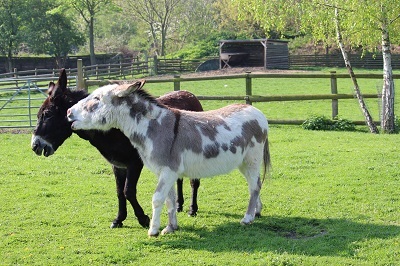 The sheep were not the only attractions, the Alpaca were enjoying the sunshine as were the various horses and donkeys. 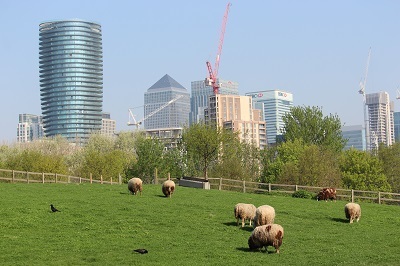 It is remarkable that in the middle of an urban scene that you can watch sheep in the field and the various animals enjoying the more rural location. If you suffer from some the strains of urban life, why not take a wander to Island Gardens and Mudchute and enjoy the wonderful surroundings.